This is such an easy way of cooking fish. You can get it all ready in advance, then pop it in the oven when you’re nearly ready to eat. No stress. Preheat the oven to 200°C/Fan 180°C/Gas 6. Melt the butter in a small saucepan, season it with salt and pepper and take the pan off the heat. Finely chop the parsley and mix it with the breadcrumbs in a bowl, then grate in the zest of the lemon. Season well. 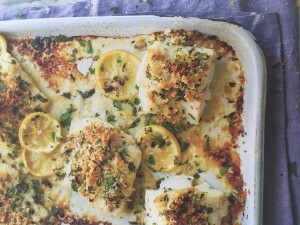 Dip each piece of fish in the melted butter, place it in a baking tray, then top it with lemony breadcrumbs. Finely slice the lemon and place the slices around the pieces of fish. Drizzle with olive oil and bake the fish for about 15 minutes until golden brown and just cooked. Jewish Digest Tip: If you are gluten intolerant you can replace the breadcrumbs with a gluten free option eg: gluten free cornflake crumbs.